Five Hot swappable 1.1 kW rectifiers modules. Fully programable controller with TCP/IP MODBUS+ ethernet/ SNMP. 9 x 12V 100Ah Batteries ( 4 hours backup ). Distribution rack for powering 8 panel 11kV switchgear DC loads and SEL relays. 6.4kW 110VDC charger expandable to 8kW. 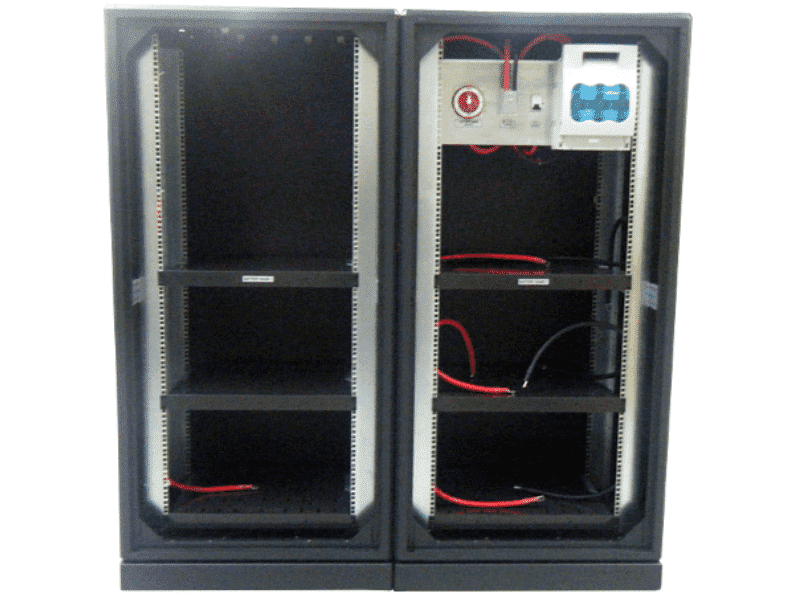 33U floor mount cabinets for both the Charger (CAB479) and battery cabinet (CAB480). An IRM-1296-L 110VDC/230VAC 1.2kW inverter. 110VDC Distribution with 7 x 20A 2P MCB’s. 230VAC Distribution with 4 x 10A 1P MCB’s. Low Voltage Disconnect and Remote control with MODBUS and SNMP. 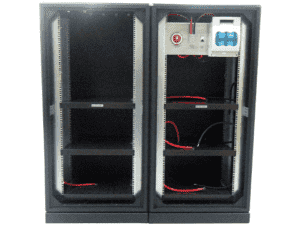 4 x 1.6kW Hot Swappable convection cooled rectifiers. Mains Fail, Low Volts, High Volts and other System alarms. A 155Ah 110V Battery bank with 9 x NSB155FTRED batteries. DC Distribution with 2 x 20A, 2 x 16A, 9 x 10A and 4 x 4A MCB’s. The charge size is 9kW 326A at 27.6VDC with space to increase to 12kW 434A. 2 MCCB 400 A ( Battery and Load). Distribution Panel 3 MCB with shunt and auxiliary contact . 3 Phase surge protection device. 10 digital meters ( Battery Voltage , Battery Current , Battery Temperature and AC input ). 3 x 3kW 27.6VDC rectifiers with meters and decoupling diodes. Alarms relay contacts: Main Fail , Rectifier fail , DC low , DC high , Earth fault , Low Volt disconnect and Over temp. The system comprises of 9 x SR750 24V chargers connected in parallel. 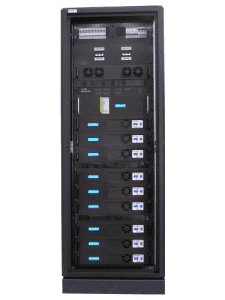 SNMP universal rack mount RTU controller which takes care of the alarm reporting in term of SNMP, HTTP , EMAIL or SMS. ALMO control unit manages all the alarms from various sources and passes the combined alarm statuses to the RTU controller. The ALMO controls the Low Voltage Disconnect. Battery bank 24VDC 1080 Ah split into two sub battery banks of 540 Ah. 2 x 1666mm H 800mm W x 600mm D (Including Plinth). 12U 19” Distribution Hinged Wall Mount 635mm H X 600mm W X 600mm D , bottom Entry. Isolated from the charger By a 2P 350 A isolator. Digital Volt and Current Meters. 33U 1666mm H 600mm W X 600mm D.
Programmable alarm relays , SNMP , Modbus comms. 2XOutputs Diodes , test points with voltmeter and selector switch. 4 x 24U 1257mm H 800mm W X 600mm D Baterry Cabinet.